22 | TH E M R EP O RT FEATURE For example, baby boomers and generation X are two to three times more likely than millennials to become delinquent in making a payment by 12 months or more. Across the financial marketplace, there is a misconception that mil- lennials do not want to establish or use credit. However, the study uncovered that this generation is, in fact, applying for credit but being denied based on new challenges, standards and policies. This lack of information reflect- ing their healthy financial habits is the biggest barrier to entry for millennials looking to jump into the mortgage market. When taking a comprehensive look at the generation, it is difficult to deny that millennials are facing unprecedented financial challenges that previous generations did not encounter. What This Means for the Housing Market M illennials want to establish credit and buy homes, but they are being overlooked because of traditional data sources. Given that traditional scoring does not accurately capture this group's credit worthiness and risk, there is an urgent need for a solution that wel- comes the 75.3 million millennials in the United States to the financial marketplace. The solution is to find a way to assess credit worthiness that provides insights into millennial purchasing behavior, rather than relying solely on traditional metrics. Using a score that includes alter - native data, such as the individual's credit behavior in wireless, banking, peer-to-peer lending, checking and savings and the subprime markets, will be more telling for the indus - tries where millennials are seeking to establish credit relationships. PATRICK REEMTS is the VP of credit risk solutions for ID Analytics. He has more than 15 years' experience in the consumer lending space. Previously, at Discover Financial Services, he launched the first-ever credit bureau trigger prescreen program with Experian. Reemts also pioneered the use of FICO's Strategy-Ware for making large decision-tree and score-based credit decisions for HSBC's card division. Alternative Data FAQ What is alternative credit data? C onventional credit scores are based on consumer data taken from credit card, mortgage and auto lending records. In addition to considering this type of conventional credit data, alter- native credit data looks at proprietary alternative insights, including wireless, banking, peer-to-peer lending, checking and savings, and subprime markets. Address change histories are also taken into account. 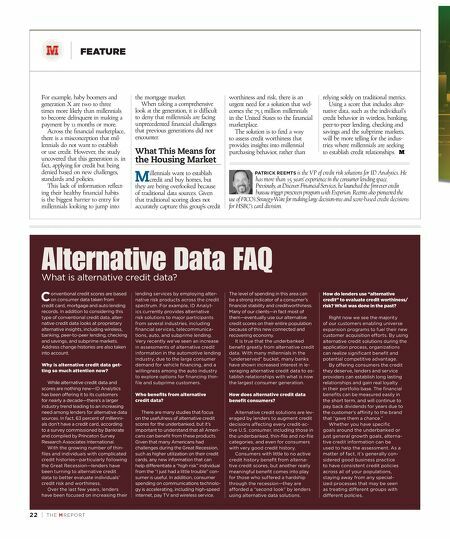 Why is alternative credit data get- ting so much attention now? While alternative credit data and scores are nothing new—ID Analytics has been offering it to its customers for nearly a decade—there's a larger industry trend leading to an increasing need among lenders for alternative data sources. In fact, 63 percent of millenni- als don't have a credit card, according to a survey commissioned by Bankrate and compiled by Princeton Survey Research Associates International. With the growing number of thin- files and individuals with complicated credit histories—particularly following the Great Recession—lenders have been turning to alternative credit data to better evaluate individuals' credit risk and worthiness. Over the last few years, lenders have been focused on increasing their lending services by employing alter- native risk products across the credit spectrum. For example, ID Analyt- ics currently provides alternative risk solutions to major participants from several industries, including financial services, telecommunica- tions, auto, and subprime lending. Very recently we've seen an increase in assessments of alternative credit information in the automotive lending industry, due to the large consumer demand for vehicle financing, and a willingness among the auto industry to explore options for financing thin- file and subprime customers. Who benefits from alternative credit data? There are many studies that focus on the usefulness of alternative credit scores for the underbanked, but it's important to understand that all Ameri- cans can benefit from these products. Given that many Americans had challenges during the Great Recession, such as higher utilization on their credit cards, any new information that can help differentiate a "high risk" individual from the "I just had a little trouble" con- sumer is useful. In addition, consumer spending on communications technolo- gy is accelerating, including high-speed internet, pay TV and wireless service. The level of spending in this area can be a strong indicator of a consumer's financial stability and creditworthiness. Many of our clients—in fact most of them—eventually use our alternative credit scores on their entire population because of this new connected and recovering economy. It is true that the underbanked benefit greatly from alternative credit data. With many millennials in the "underserved" bucket, many banks have shown increased interest in le- veraging alternative credit data to es- tablish relationships with what is now the largest consumer generation. How does alternative credit data benefit consumers? Alternative credit solutions are lev- eraged by lenders to augment credit decisions affecting every credit-ac- tive U.S. consumer, including those in the underbanked, thin-file and no-file categories, and even for consumers with very good credit history. Consumers with little to no active credit history benefit from alterna- tive credit scores, but another really meaningful benefit comes into play for those who suffered a hardship through the recession—they are afforded a "second look" by lenders using alternative data solutions. How do lenders use "alternative credit" to evaluate credit worthiness/ risk? What was done in the past? Right now we see the majority of our customers enabling universe expansion programs to fuel their new customer acquisition efforts. By using alternative credit solutions during the application process, organizations can realize significant benefit and potential competitive advantage. By offering consumers the credit they deserve, lenders and service providers can establish long lasting relationships and gain real loyalty in their portfolio base. The financial benefits can be measured easily in the short term, and will continue to pay back dividends for years due to the customer's affinity to the brand that "gave them a chance." Whether you have specific goals around the underbanked or just general growth goals, alterna- tive credit information can be used to help the assessment. 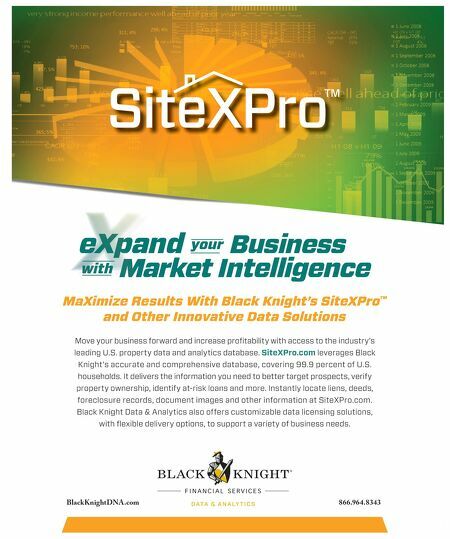 As a matter of fact, it's generally con- sidered good business practice to have consistent credit policies across all of your populations, staying away from any special- ized processes that may be seen as treating different groups with different policies.